I'm participating in the Literary Blog Hop by giving away a $20 gift card to the Book Depository! Want to win? It's the easiest giveaway you'll ever enter. I'll have an October wrap-up post up soon. Also, I'll be reviewing Brutal Youth by Anthony Breznican on Monday. I am just the happiest little Trekkie. I'm gobbling up Star Trek: The Next Generation for the great re-watching of 2014. I've started Rebecca by Daphne du Maurier. I haven't made much progress due to the Star Trek binge-fest. I'm finding it atmospheric and lovely, so far. I made chicken tortilla soup and cornbread yesterday. It seemed appropriate for a chilly Halloween day. Earlier in the week I made a mushroom & swiss - macaroni & cheese that was a big hit. As the weather turns colder I'm very much in the mood for warm and comforting foods. As you can see, I'm messing with the format of my weekly update. I was feeling hemmed in by my previous arrangement. I've always admired the way Kim and Tina (and others) have composed their updates so I'm shamelessly ripping them off. Over on River City Reading, Shannon shows how to navigate nonfiction titles on Edelweiss. Handy! Did you have a good Halloween? I stayed in and gave out candy to the hundreds of kids that knocked on our door. Our 'hood is great for trick or treating because the houses are fairly close together and it's well lit. We end up giving out candy to lots of little ghosts and goblins. It's so fun to see all the costumed cuties. The Walking Dead is on tonight. Hooray! I love your category titles! Especially "anticipating" and "sharing". My October Round-Up is up today - my Bloglovin feed is down again, so you may not see it if you use Bloglovin. Thank you :D I like this format much better. I can change it to suit what's going on in my life on any given week. That costume has been a big hit, lol. It suits her SO perfectly. :D You're welcome! And oh man, Rebecca. Atmospheric as all hell, it's so perfect for this time of year. I hope to make some darn time for the book. Star Trek and now Nonfiction November are taking up all my time! Yay for both TNG and Rebecca, both great stories! I'm having a great time with TNG. I'm just happy as a clam sitting here with my big nerdy headphones on while my family lives life around me, lol. I was seriously blown away by your son dressing up as The Joker when I saw it in my Instagram feed and your daughter's costume made me guffaw out loud. At first, I thought you were trying out a new look. ;) And I like the new format. I always enjoy reading your posts. Those costumes are so awesome!! And chicken tortilla AND cornbread sound delicious. Now that our weather is finally cooling down, I'm looking forward to yummy comfort foods as well. Thanks! We had a hoot putting them together. :D I was quite impressed with the cornbread. It's sweet, but not TOO sweet. If anything it might have been a bit too dense for me? I've got a cheesy cauliflower soup on tap for this week that I'm crazy excited about, lol. This is the first year I've seen a crazy cat lady costume, and I saw three different versions of it. But I love it, and I'm most likely going to steal it at some point. You're right...that is THE easiest giveaway ever!!! Your chicken tortilla soup pic the other day inspired me to throw chili in the crock pot, and it was goo-ooood. Have a great week, lovely! 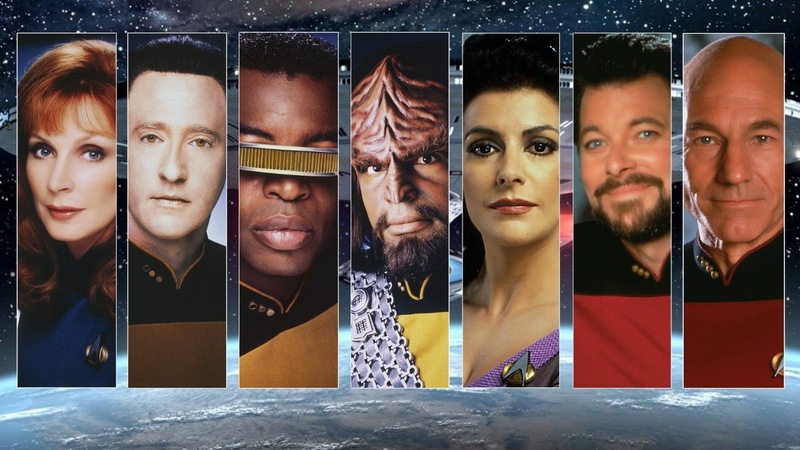 I love TNG! I'd love to binge watch it. Glad you're enjoying Rebecca so far. I really liked it, although my favourite Du Maurier novel is My Cousin Rachel (which I recommend highly if you haven't read it). Thanks! We had so much fun putting the costumes together. :D I wish I had counted kids this year. It wasn't our busiest year, I don't think, but I bet we had close to 350 kids? Love those costumes!! So cute! We hardly have any trick or treaters so I didn't give out candy this year. We had a little African American girl come to the door with a cotton candy costume. She might have been 3 years old. She had a little suit with pink fluffy stuff all over and on her head she wore the cone. OMW!! Later my husband said we should have gotten a picture. What a cutie. I love your kids' costumes! They are great. We made some chicken fajitas yesterday with all the fixings. The avocados were perfectly ripened for the guacamole, and I made a fresh tomato salsa. Yum! I agree with Andi, the picture of your chicken tortilla soup was awesome. Oh I bet she was adorable :D I love clever costumes like that! Mmmm! You know, I've never made actual fajitas. I've made fajita soup and fajita casseroles, etc. but never have made just fajitas. They sound really good right now too! I really enjoyed Next Generation Back when my husband and I watched it. I love the costume -- the crazy cat lady is hilarious. I'm having so much fun re-watching it! I'm going to be sad when it's done. Love the kids' costumes!! Too fun!! And that Spiderman gif is cracking me up. The gifs that people make from the old Spiderman stuff are SO great, lol. Hide your cats, world! She WILL steal them and bring them home, lol. 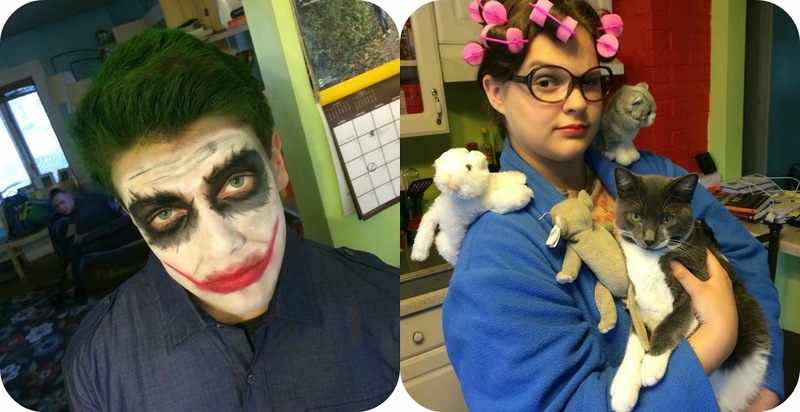 Awwww.... love your kids' costumes! Rewatching TNG looks like fun. Thanks :D It was pretty chilly here this year but it didn't rain or snow which is always a good thing, lol. Love the costumes! I wasn't feeling great on Halloween so I didn't dress up but at least there's always next year. I hope you enjoy your read of Rebecca! I hope you're feeling better now! Maybe next year you can be a crazy cat lady, lol. Those costumes are great!!! Love the crazy lady. Oh my goodness, the crazy cat lady costume is killing me! So great. Ohhh my word, that risotto sounds stupid good! Beer and cheese? Hello to my favorite food groups, lol. Thanks :D She's received such awesome compliments on it. Success! I'm a Trekkie as well!! :) Though in recent years, I've preferred Voyager to TNG. I know, I'm in the minority. Thanks for sharing. :) Here's my It's Monday! What are you Reading? post. It can be fun, even if it costs a small fortune to have enough candy, lol.